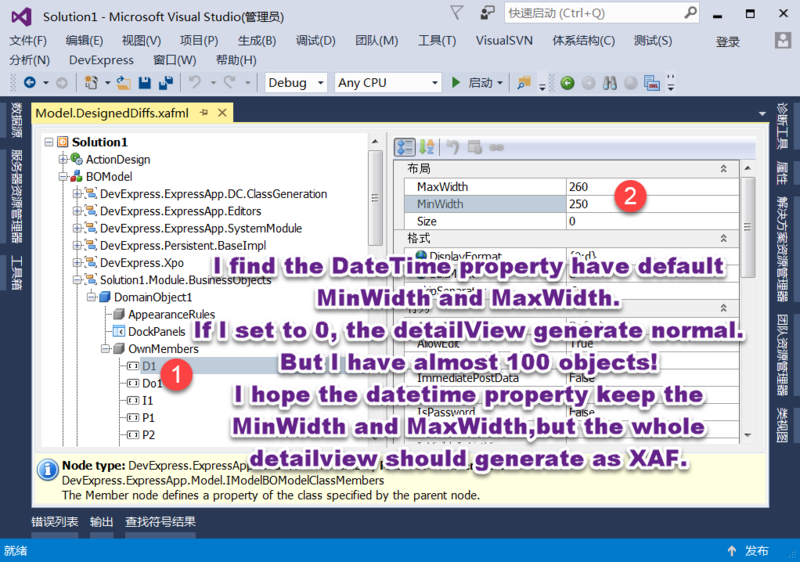 If the business object has DateTime property, the detailview generate abnormal. In my solution, domaincompent1 have 8 properties. It's detailView have two columns. If I do not use Xafari, the two columns would go fifty-fifty the view width. But after I use Xafari, the column which have DateTime property would keep width. I hope the two columns can divide the width equally. the DateTime property can have minwidth and maxwidth. attached is my question and sample solution. You can set MinWidth and MaxWidth a value = 0 at first solution this issue (see your attached file 02.png). Please, inform us if this answer is suit for you. Yes. I can set MinWidth and MaxWidth a value = 0 or ModelDefault('MinWidth','0') to avoid the detailView generation ugly. But I want 'MinWidth' and ‘MaxWidth’ only constrain the propertyEditor's width . and don't constrain the layout column' width. Do you have better solution? The DevExpress provides this behavior for DetailView at a MinimumSize/MaximumSize of items. As solution, you can add empty space for item with MinimumSize/MaximumSize, see attached file FieldSize.zip.